West Windsor, N.J. – There were lots of reasons to celebrate on Oct. 29 as Mercer County Community College (MCCC) students convened with generous donors at the Honors Recognition Reception for Continuing Students. The cafeteria on the West Windsor campus was packed with high-achieving students and their proud family members. Representing practically every area of study at the college, the assembled students had an opportunity to thank those who are helping to make their college education possible. It has been a big year in donor relations at the college, with 156 scholarships – six of them newly established – awarded to new and continuing students. A total of $166,360 has been distributed. Twenty-two students received multiple awards. In her words of welcome, MCCC President Patricia C. Donohue gave special recognition to the donors in attendance. “We host this event to congratulate our students, but also to provide our donors with a chance to meet their students and see first-hand how important their contributions are,” she said. Among the presenters was first-time donor Caroline Zucker, who established the Mel Zucker Memorial Scholarship in honor of her husband. Professor Zucker taught engineering, physics and math at Mercer for more than three decades. “These were feared subjects for students,” Zucker said. “Mel always encouraged his students to excel. But he tried to teach them with humor. If you were late for his class, you had to tell a joke in front of your classmates.” The scholarship was presented to Hyunwoo Kim, who is pursuing his degree in Engineering and plans to transfer for his bachelor's degree after graduating in May. 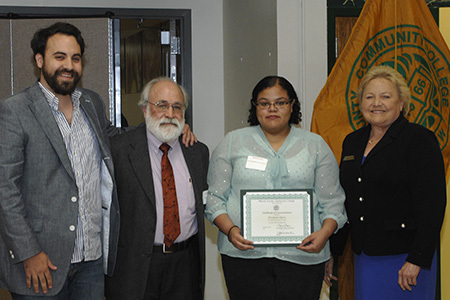 The new Anne Bobo Memorial Scholarship was presented by her husband, Nestor Arroyo, and her son, Adrian. Bobo, who taught Advertising Design at Mercer for many years, was a huge advocate for the power of education. In his remarks, Adrian shared a note his mother had written. “Before coming to Mercer, my mom worked in advertising, which she said was all about trying to make people’s choices for them. She wrote that education was about empowering people to make their own choices.” The scholarship was awarded to Advertising Design student Elizabeth Harris. Mercer welcomed Grainger Inc. representative Patty Wilson, who presented Grainger’s “Tools for Tomorrow” scholarships to two students, Rachel Bjelke and Darryl Fletcher. Grainger, a product maintenance distributor with a major distribution center in Robbinsville, has created the annual scholarship program for outstanding students at 125 community colleges nationwide. Another new scholarship was presented by the Trenton Alumnae Chapter of the Sigma Theta Sorority, Inc., whose mission is community service. Patricia Reed presented awards to three students, Kelly Blake, Hailey Skopas and Victoria Trimble. MCCC's Hotel, Restaurant and Institution Management (HRIM) program once again felt the generosity of local restaurants and food service companies. Chef Jacket Partnership scholarships were presented to cover costs for nine students’ chefs whites, as well as additional college costs. Participating businesses included Agricola, Blue Bottle Café, Ergo Chef LLC, Mercer Oaks Catering, Nassau Inn, Sysco Foods, Terra Momo Restaurant Group, Wegmans Food Markets, Inc., and Jersey General Salsa Company, which was represented by Jersey General partners Frank Benowitz, MCCC culinary instructor and Dave Aust. 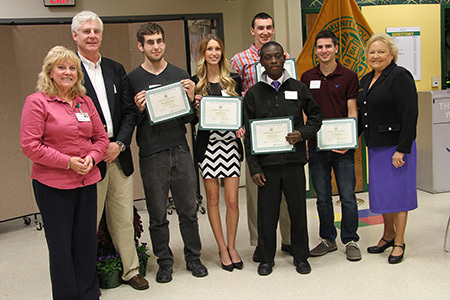 Professor Emeritus John Santosuosso was on hand to present Professors Emeriti scholarships to seven students. Santosuosso, who taught Engineering at Mercer, serves as the vice president for the 74-member association. Also in attendance was Andrew Koontz, chair of the Mercer County Freeholders, who presented scholarships on behalf of the freeholders to 13 first-year students. Long-time supporters and regular attendees at the event were Dean Prassas and his wife, Rita. 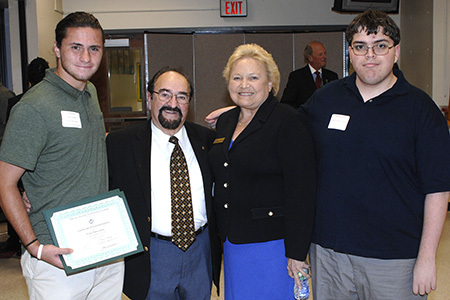 Dean presented the Anthony and Sophie Prassas Memorial Scholarship to Nursing student Christopher Reiser. “I was a member of the first MCCC graduating class in 1968. Mercer was a nice beginning for me,” said Prassas, who went on to a successful career in business. Both of his daughters are MCCC alumni as well. The scholarship he established alternates each year; one year it is awarded to a nursing student in honor of his mother, who benefited from excellent nursing care before her death, while the next year it is awarded to a culinary student in recognition of his father’s career as a chef. Reiser, this year’s recipient, is following his wife, an MCCC alumna, into the nursing field. “We always tell young people to come to Mercer,” Rita added. For more information about ways of giving to MCCC, visit the MCCC Foundation page here. More about MCCC scholarship opportunities is available here. Advertising Design student Elizabeth Harris is the first recipient of the Anne Bobo Memorial Scholarship, presented by Adrian, far left, and Nestor Arroyo. Pictured at right is MCCC President Patricia C. Donohue. 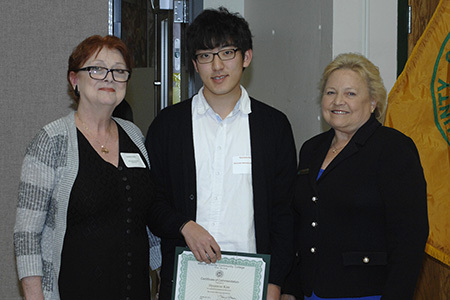 Caroline Zucker presented the first Mel Zucker Memorial Scholarship to Hyunwoo Kim. At right is MCCC President Patricia C. Donohue. The Sky's the Limit Fund, established by the Friends of Trenton-Mercer Airport, continues to provide scholarships to multiple students studying aviation. Pictured are Aviation Program Coordinator Joan Jones, Sky's the Limit representative Wolcott Blair, students Christopher Barbieri, Brittany Wood, Wisdom Agyei, Timothy Harman (back) and Brian Kilpatrick, and MCCC President Patricia C. Donohue. 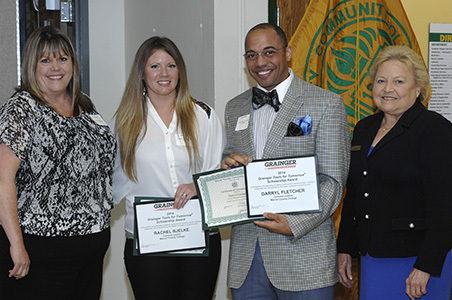 From left, Grainger representative Patty Wilson, students Rachel Bjelke and Darryl Fletcher, and MCCC President Patricia C. Donohue. 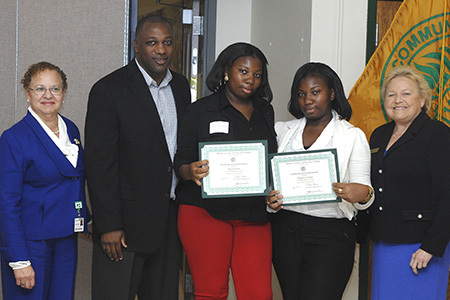 Donor Reggie Coleman presented Boys & Girls Club scholarships to twin sisters Kiya, third from left, and Emporia Green. Also pictured are Exec. Dean Diane Campbell, far left, and President Patricia C. Donohue. Students Tyler Sincoskie, left, and Sean Rackowski, right, received Architecture scholarship. They are pictured with Foundation Board member and long-time donor Jim Faridy and President Donohue. 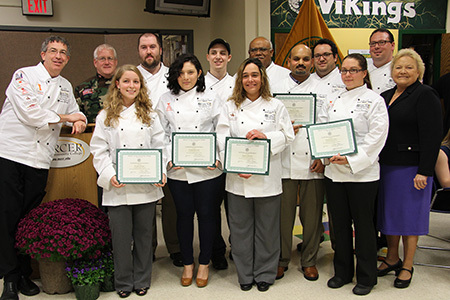 (Front row from left) Chef Jacket scholarship recipients Regina Dripps, Carina DeLeon, Sharon Wojcik, Dharam Singh and Natalie Russano, with President Donohue; back row from left, HRIM Coordinator Doug Fee, Jersey General Salsa donor David Aust, students Robert Van Saun, Michael Polito, Oz Gomez and Juan Cobos, and instructor Frank Benowitz.